Dr. Buchanan is an associate professor and Director of the MSN Program and Co-Director of the BSN to DNP. Dr. Buchanan received her undergraduate and graduate degrees from the University of Nebraska Medical Center College of Nursing. She received her doctoral degree in therapeutic nursing intervention from the University of Washington in Seattle. She received a post-master certificate from UNMC in adult health as an ambulatory primary care nurse practitioner. She is also certified as a Tobacco Treatment Specialist trained through Mayo Clinic. Her practice is in the area of adult gerontology, health promotion, prevention and secondary screening intervention. She also consults for tobacco treatment at the Nebraska Medical Center, VA Hospitals and nationally. Dr. Buchanan is also interested in primary care advanced practice partnerships for rural and underserved populations. She has studied innovative methods of care delivery including personal digital assistant for managing nicotine addiction and relapse prevention. Her current work is in the area of increasing the workforce numbers and preparations through development of an academic practice partnerships with rural and underserved areas of Nebraska. Teaches in the adult gerontology specialty track classes for health promotion, health maintenance, primary prevention, and secondary screening, comprehensive adult assessment for adults across the lifespan adolescent to geriatrics. Dr. Buchanan teaches health assessment and health promotion classes in the College of Nursing. 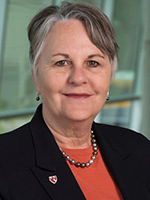 Dr. Buchanan has been a participant in the Legacy Foundation core curriculum for tobacco addiction and control and teaches nurses about interventions for patients with tobacco addiction. She also lectures on treatment approaches, medication prescription, counseling, problem solving, and self management training skills for patients who want to quit smoking. Dr. Buchanan has a practice at the Nebraska Medical Center for patients with tobacco addiction and consults with other Centers to set up services of this type. American Nurse's Association Credentialing Center as an Adult Nurse Practitioner. Mayo Clinic Certificate as a specialist in tobacco addiction. Past Board Member Nebraska Department of Health and Human Services Advanced Practice Nursing Board (2002-2006). 2017-2018 Advancing Nursing Education Workforce, Activating Linkages Interconnecting Graduate Nursing and Advanced Practice Partners of Nebraska. Health Resources Services Administration, #T94HP30901. ($ 1.2 million), July 2017 to June 30, 2019, Principal Investigator and Project Director.